Performances throughout are superb. (...) The sonics are realistic enough to use for demonstration of how small ensembles should sound. 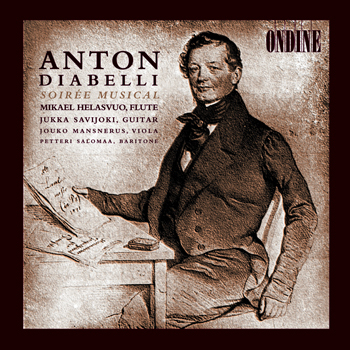 This CD features chamber music works by Anton Diabelli, which are performed on period instruments. The instrumental pieces include are the Serenata concertante for flute, viola and guitar, Gran variazioni for guitar solo and Grande serenade for flute and guitar. The Sieben Gesänge für Herz und Gefühl ('Seven songs of heart and feeling') have also a chamber music dimension with the singer accompanied by a flute and a guitar.